The farmers I know, and this is coming from an avowed city slicker, are hearty, resolute, and self-reliant. As a financial farmer, I think we can all learn a lot from that temperament. I particularly wanted to focus on self-reliance today because all this talk of a government shutdown got me thinking; what if, on this the potential 18th time of a government shutdown since 1976, we didn’t reopen? Although I peg the possibility of a sustained government shutdown at 0%, just for a mental exercise, a la Lumosity, let’s play this out along a possible outcome. Depending on the severity and length, I suspect there would be a gradual worsening of the overall societal situation. Initially, I think there would be little to no effect, a small crack in the social order. There even may be a short-term boost in productivity, but as more and more governmental organizations cease to function, in particular those that support infrastructure and the rule of law, I can’t help but believe our society is adversely impacted. That small initial crack now spiders. Many elements that we take for granted; from defense, social programs, and medical services begin to fracture. Over time, logistics like food supply, fuel, and delivery of basic services like water degrade. By definition of the law of supply and demand, the demand for these services remains constant or may even increase while the supply falls, making them more and more scare (and expensive in real dollar terms.) On a sliding scale, I would argue there would be a noticeable and sustained movement towards a “gold, ammunition, and canned goods” portfolio and away from one of equities, bonds, real estate, art, and paper currency. Gradually, then all of a sudden, portable wealth and power become more important. The last two elements of the “crisis portfolio,” namely ammunition and canned goods, I don’t know too much about to make educated comments. But gold on the other hand, I think I know enough to build a plausible theory of what could happen next. If you haven’t had a chance yet to read the Crisis of 1837, please do. It is a very real example of what happened when our economy collapsed and the ensuing rush to obtain gold coins, then termed “specie,” occurred. Although over 175 years have passed, I think the game plan remains the same, as gold would replace paper currency for many transactions and “Pay at time of service” becomes the norm. Rather than the 1 oz. Gold Eagles we typically see for sale, I suspect smaller denominations like 1/10 oz. Gold Eagles become the most common unit of currency because they can purchase basically a portable amount of food, fuel, and basic supplies. 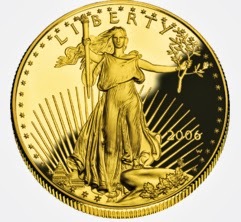 The $5 face value U.S. Gold Eagle represent a value that is understandable and quick to trade on; and gold’s timeless value has been built on the simple fact that gold equals toil. Toil in mines, toil in processing, toil in manufacturing, toil in storage, and toil in safety; gold equals portable, almost impossible to replicate toil. The $5 face value 1/10 oz. U.S. Gold Eagle become the true “bit” coin; I find it hard to believe that our entire computer system will be functioning perfectly, that merchants will accept electronic money over physical gold. Bitcoins? I don’t think so. Diamonds? Possible, but too few people know how to adequately value them, and there is just too much value in some to purchase small quantities of necessities. Art? Maybe, but at what value and to whom? The end game is physical goods for physical goods. I think nothing captures that trade-off better than gold. Could the U.S. Government close down for a week? Two weeks? A month? Maybe, but as mentioned above, I think there is a 0% chance of a sustained U.S. government shutdown in the foreseeable future. Too many indicators point to continued prosperity; from the housing recovery, decrease in unemployment, and most importantly the loose monetary policy. In my view, the bullish case is just too strong. What we’re seeing now is political posturing at its worst, with U.S. citizens held captive to this Washington drama. Nonetheless, I think it behooves the financial farmer, indeed any investor, to think about a worse case scenario that may occur some time in the future. A prudent farmer has a grain silo and is rarely without capital in its many forms; I think $5 face value, 1/10th ounce U.S. Gold Eagles are a good choice. The closer you can obtain them to the true spot price of gold the better. They’re portable, useful in small bulk purchases, and challenging to replicate. They don’t rust and aren’t vulnerable electronic corruption. There’s a reason why gold has been so dear over thousands of years; new “currencies” may emerge, but until alchemy finds a way to turn lead to gold, it still has the best luster.